Height is typically the first thing a person thinks about when installing a deer fence, but not without good reason. A deer, when motivated, is able to jump between six to eight feet, depending upon whether it is standing still or has a running start. Hopping a fence is not the first plan of attack for a hungry deer, but when a deer is frightened or when food is scarce and there is no other way inside, it may make an attempt. DeerBusters offers poly deer fence at heights between six and eight feet, depending upon your needs. 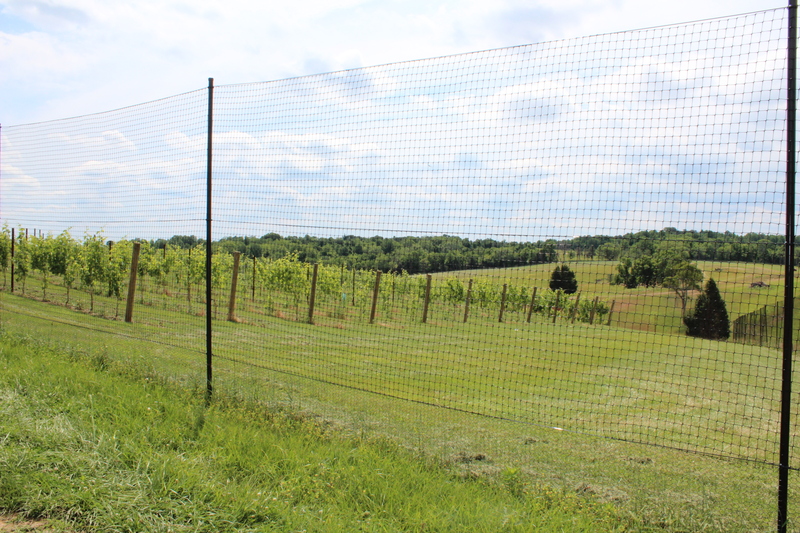 Strong monofilament wire running the length of the top of the fence keeps the top of the fence taut and free of sagging and low points that might tempt a deer to jump. Though the height of your deer fence is an important consideration in protecting your crops or garden from hungry deer, the bottom of your fence will require a significant amount of your attention. A deer has a number of things to consider when deciding to jump a fence; an eight-foot jump is no easy or safe task. It will usually attempt to test the bottom of the fence first by digging and squeezing, and ultimately trying to crawl under the fence rather than risk an unsafe and difficult jump. Like the top of a DeerBusters Poly Fence, the bottom of the fence is reinforced with a 700 lb. or 1200 lb. break load monofilament wire. Two types of ground stakes, kinked galvanized steel and heavy duty rebar for hard terrain, are available to tether the bottom of your fence tightly to the ground and prevent anything from getting underneath. Above all, a DeerBusters Deer Fence is strong. Polypropylene is an incredibly tough plastic polymer able to resist heat, cold, and corrosion damage after long periods outdoors as well as considerable impact from another object, like a large deer that may push and pull at it or run into it if startled. Our poly deer fence has a breaking strength of between 600 lb. and 850 lb., and our strongest poly fence is made to last twenty years. This is important, as a deer will search along the entirety of a fence for a rip, hole, or some way inside if something smells attractive. The combination of sturdy polypropylene, tight monofilament, and properly spaced and tightened self-locking ties will create a boundary of strong materials without gaps or weaknesses that will not only look clean, but will keep deer out.